I tend to say I'm more character-driven than plot-driven in the writing of my novels. However, if I were to say that I am a character writer, it wouldn't be true. Not really. I think most people who claim to be character writers aren't. Not exactly. The reality is, my characters drive their own actions by their behavior, which is defined by their character. However, when I start any particular novel, there is an idea of a story I want to tell. I don't simply sit down and say I'm going to write another book with Ashlyn, or Tain, or Lara and Farraday. Before I can revisit any of my characters in a work - be it short or long - I need a story idea that fits with their character that I believe can work together. For me, the reality is that I see character and plot as the two horses pulling the carriage. For some writers, character might be stronger than plot, and for other writers it's the other way around. However, both are required to complete the novel. For my money, the man who is writing character novels in the truest sense is also one of the most overlooked authors writing and publishing today, and for any writer serious about learning what it is to write a completely character-driven novel, they must dive deep into the works of James Sallis. I didn't know what to expect when I first read Sallis. And because the reading experience was unlike anything else I'd experienced before, at first, I wasn't sure how to formulate my response to the book in any way that made sense. I was used to picking up books that were about this murder or that police investigation, or this kidnapping, or that assassination plot. Books that had a goal. A defined focus. Stop the killer before he strikes again, catch the killer and bring peace to the family. Prevent global chaos and political instability. Lofty goals with high stakes. If you bring those expectations to a Sallis book, you won't know what hit you. Unfortunately, I think a lot of people are confused as a result, and move on to more familiar territory again. For me, I was fascinated. I recall saying that as a bass player, Sallis demonstrated he knew exactly which notes to leave out, which is at least as important as knowing which notes to put in a story. Read the Turner books, read the Lew Griffin books, and what you will be reading are books that are about them. About Turner, about Griffin. Not about any one particular case or revelation or defining moment in a career. With the Griffin books, in particular, the character is revealed one piece at a time, the layers stripped away. This was my original review of The Long-Legged Fly. Sitting down with James Sallis’s The Long-Legged Fly, I had no idea what to expect. I knew it was the start of a series and, in keeping with a recent trend, it was yet another PI novel to make its way to the top of my TBR pile. From the Turner books, I was aware of Sallis’s unrivaled storytelling skills. Sallis has mastered the art of painting with words, and maximizing the effectiveness of each word chosen. A typical Sallis novel runs close to 60,000 words, and yet the words I’d use to describe the writing are lush, evocative, potent. The Long-Legged Fly is no exception. We begin with Lew Griffin in 1964 and follow his life, in segments, until 1990. The two hundred pages highlight defining moments within Griffin’s journey, and some might argue some scenes are fictional excerpts from Griffin’s later life as a novelist. However you interpret the story, it’s impossible to deny the originality of Sallis’s approach. When I pick up a crime fiction book, I generally have some idea of what to expect. The PI genre has its own tropes, yet has certain similarities to police procedurals. In most novels within these subgenres a crime is committed. A detective is either sent out (in the case of the police) or hired (in the case of the PI) to investigate. The story unfolds from there. The Long-Legged Fly is not about the investigations. Anyone who picks up this book expecting to sink their teeth into a prolonged investigation centered on one case, with secrets to be unearthed as the investigation unfolds, will be disappointed. 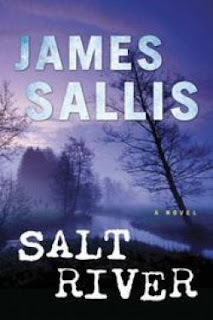 Sallis effectively turns the genre on its head, making the protagonist the mystery. The book is an investigation of him, his motives, his inability to form meaningful connections with the people around him, how he justifies his actions or lack of actions, how he lives. I’ve recently read several PI novels, including The Price of Blood by Declan Hughes, Trigger City by Sean Chercover, The Good Son by Russel D. McLean and The Little Sleep by Paul Tremblay – all solid offerings by talented writers, up-and-comers who have debuted in the past few years. Following those books with The Long-Legged Fly made me wonder if part of Sallis’s secret, what makes him so distinctive, (forgive me Mr. Sallis) lies in his age. We now live in a hyper-psychoanalytic era, where we’re constantly scrutinizing behaviour and trying to uncover motives and work out issues. At this stage, I’m unwilling to make a blanket statement, but the more I’ve considered the works of Sallis in general, and The Long-Legged Fly in particular, I’ve noted my own tendency to scrutinize motivations within my own writing. Sallis avoids this type of self-indulgence, which perhaps speaks to the era he grew up in. Griffin may be self-absorbed much of the time, and is clearly self-destructive, but he isn’t on a mission to heal himself. When his father is dying and asking to see him, he does not rush to his bedside to have that one last moment where all things can be forgiven. You get the sense with Griffin that once a door’s been shut, it’s shut for good, and even if it’s been slammed or knocked off its hinges in the process, Griffin feels no obligation to go back, undo the damage and try to have a happier ending. He’s unable to sacrifice, or to change to sustain the few positive relationships he has, and appears content to move through the cycles of good and bad in his life. At the very least, he’s unwilling to invest a lot of energy in changing the outcome. Another exit from his life, and Griffin never allows himself so much as a sentence of doubt or regret, or consideration of what Verne has said to him. When reviewing Salt River I said myself that as someone who played bass guitar, I felt Sallis had applied the skill of a musician to his writing; he understands that often, what you leave out is as important as what you put in. This holds true for The Long-Legged Fly as well. I’ve also said that the worst crime a book can commit is to be completely forgettable, and that’s a charge that can’t be leveled against Sallis. At the end of the book, despite the number of years covered within, Griffin remains a mystery, the motives behind his actions often unstated, his feelings unanalyzed much of the time. The character is himself the curiosity, and he lingers on the brain long after the last page, asking uneasy questions, presenting the possibility of realities that make most of us uncomfortable. Griffin may not be very moral, but he’s undeniably memorable. Perhaps the only bigger mystery is why Sallis is not wider known to the American reading audience.